Before going to my trip, a lot of people asked me “Why Bulgaria?” and I would answer “Why not?”. I’ve always found it funny why we should visit a country more than another, for me every country has something unique and special to discover. In search of this, we embarked on a road trip through the four corners of the country. Psst: At the end of this post, I’m sharing some tips and what I would have done differently looking back, so keep reading! The roads are very scenic, you will pass by tons of sunflower fields and beautiful mountains. There are countless little villages with off-white houses with one or two floors with red tiles on rooftops, vegetable gardens covered with vines. You will also encounter farm animals, wild dogs, turtles and other reptiles crossing the road. In the heartlands, you will sometimes stumble upon old communist statues near villages or even see past Bulgarian and Soviet leader painted on buildings. Most of the cars are from the 90’s and early 2000’s, you will even see Ladas in the streets. We got lost a couple of times thanks to our GPS and we stumbled into a lot of dirt and bumpy roads with elders sitting outside of their houses looking funny at us and wondering why a rented car was wandering around their tiny village. Bulgaria has a developing economy and it is still recovering from the communist era. Don’t be surprised to see lots of decayed buildings and a big clash between the countryside and the cities. Also, I was sadly surprised that there were countless graffiti swastikas and Nazi iconography across the country. We landed in Sofia and we decided not to rent a car right away. The city is easily walkable and the public transit works perfectly. The capital is unique to the rest of the country, it has a very eclectic style mixing architecture of different periods like Byzantine, socialist and ancient ruins. Check the complete guide of how to explore Sofia in 2 days here. The region next to Sofia with its mountainous roads are the most beautiful we saw during our trip. 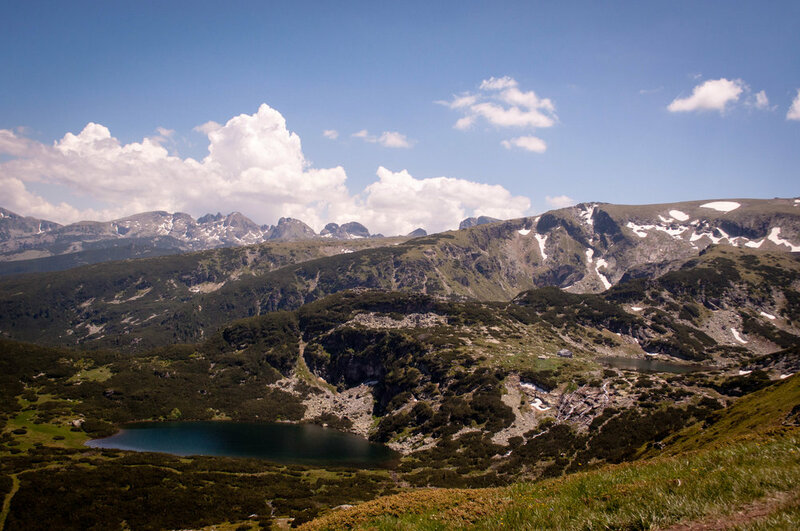 Our first stop was the Seven Rila Lakes. The pristine waters with the eternal snow and the mountain air were breathtaking. To access the lakes viewpoint, you need to take a lift for around 20min and after you climb for around 30 more minutes. The walk can be challenging due to the altitude. After all this cardio, enjoy the panorama while resting a little next to the lake. 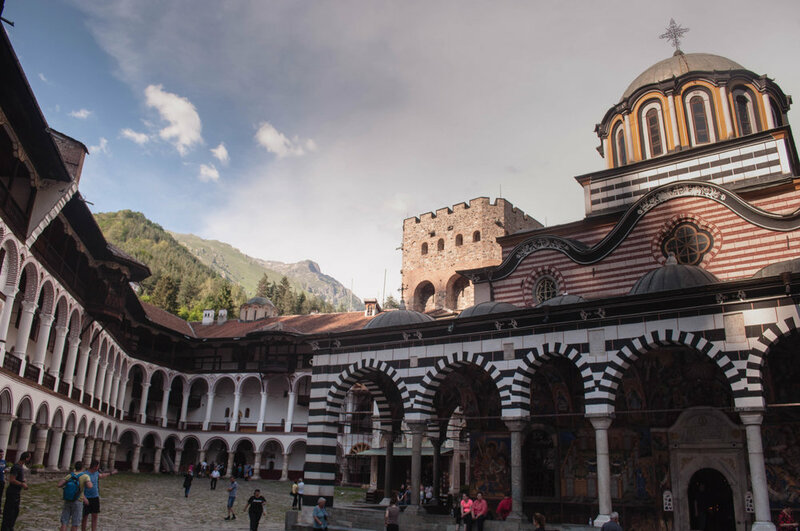 We jumped back to the car and went to the Rila Monastery. The monastery was founded in the 10th Century and has become an important spiritual hub since the medieval times. The monastery was added to the UNESCO list for its beautiful architecture that contains bright yellow domes as well as archways striped in black, red and white. The inside is ornate with jaw dropping frescoes depicting the apocalyptic dance. The monastery also offers accommodations for those who want the full experience. Having visited it, I understand why this is the number one tourist attraction in the country. The next day we went to Melnik, it is a cute little town to spend a couple of hours. It is very picturesque with its traditional architecture, most of the buildings are listed as a historical heritage. In the backdrop, there is a peculiar rock formation in shape of pyramids that make it look almost out of this world. There are several trails that go up the pyramids, for the sporty ones. The Melnik region is widely known for its wines. There are vines specific to the region, which makes the wine very different from the other varieties with aromas from the mountains. To taste the Bulgarian wine, we decided to visit Villa Melnik, one of the biggest vineyards in the country. The award-winning domain gives tours and tastings for the wine lovers. Plovdiv is the second biggest city in Bulgaria and it is very different from Sofia. The vibe is very artsy and laid-back. Kappana “The trap” neighbourhood is very lively at night with all the restaurants and bars. Near the city, you have various options for great day trip. you can visit the wineries and the UFO monument, which are only 2 hours away. 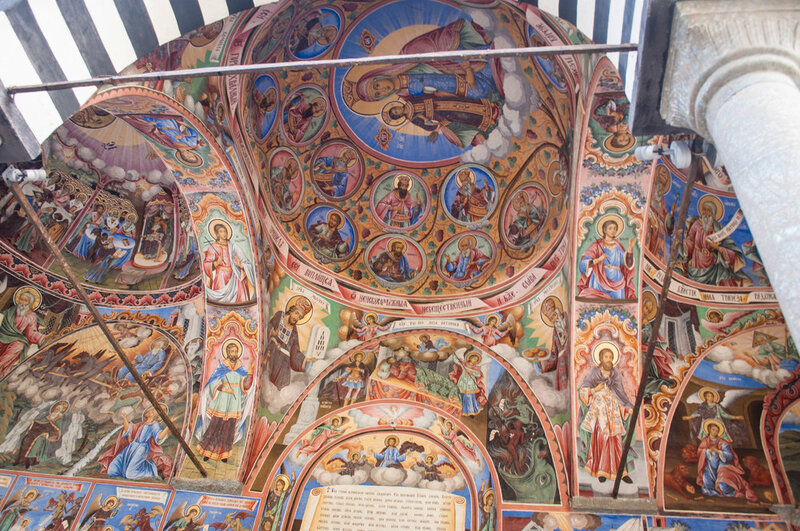 For a complete list of things to do in the city and its region, check my post about Plovdiv. 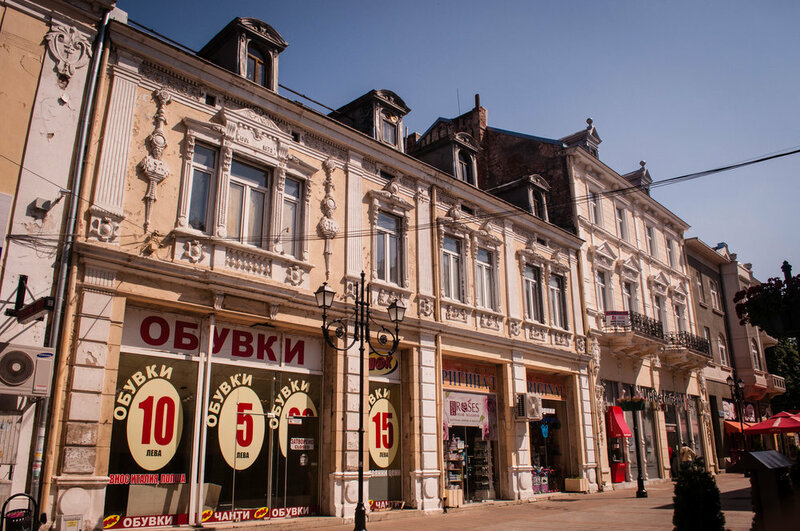 While researching for the trip, I came across Ruse, a city in the northern part of the country bordering Romania which is on the other side of the river. 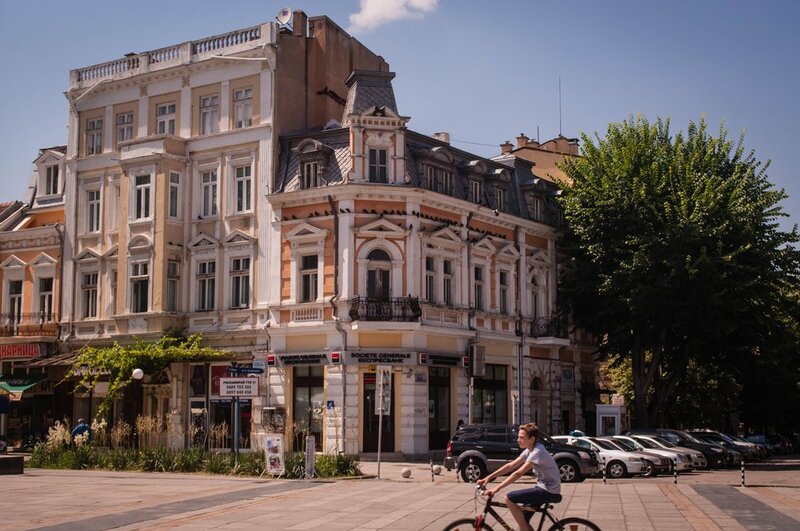 The city, sometimes called the Vienna of Bulgaria, has its own architectural style, very unique from the rest of the country. Most of the buildings are baroque and they are listed in the EU heritage. You can see a bigger presence of its neighbouring country; a lot of the signs are in Romanian. While the buildings are certainly very beautiful, the city feels empty, it seems like it was planned to be bigger but it never fully developed and it lacks activities. The big plus for us exploring this region was our stay at a B&B in Koshov, a small village, near the mountains and a national park. 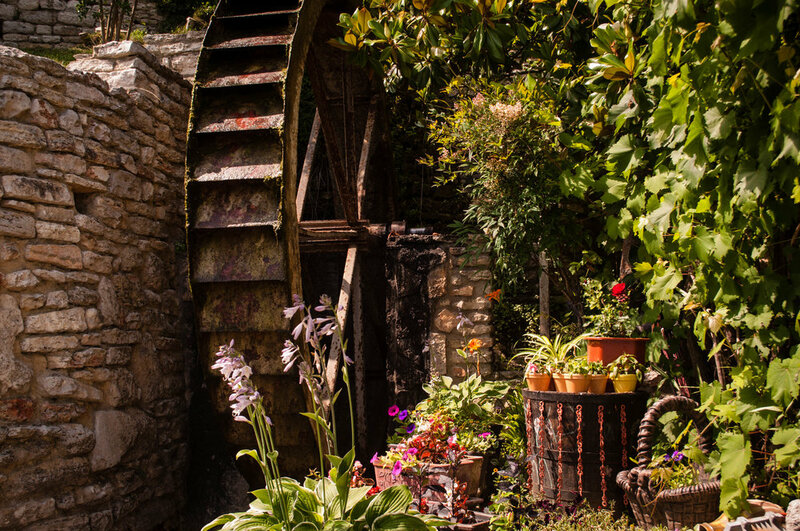 The B&B, Milkovata Guest House, is a traditional house with its own vegetable garden, chickens running free and a cute dog that wanted to be pet all the time. The couple running the house was super friendly, you could see that they invested a lot of love and time making their B&B a great stay. It was extremely affordable and the homemade food was better than any restaurant; all the vegetables and eggs came from their backyard! The relaxing night in the countryside was a break from our busy schedule. The coast is full of little towns and cities to explore. We decided to stay in Varna since it was the most central town among the coast. The city does not have anything exceptional to point out, however the strip of bars and restaurants near the beach is very enjoyable! We were surprised that they did not hike up the prices due to its location. I should point out that the water in the black sea is extremely cold! I was soo cold that I only swam once! Be sure to enjoy the activities on the main pedestrian street. You will see that every city has a big pedestrian street where there tons of restaurants and bars. I guess that these streets had a different purpose under the communist regime. 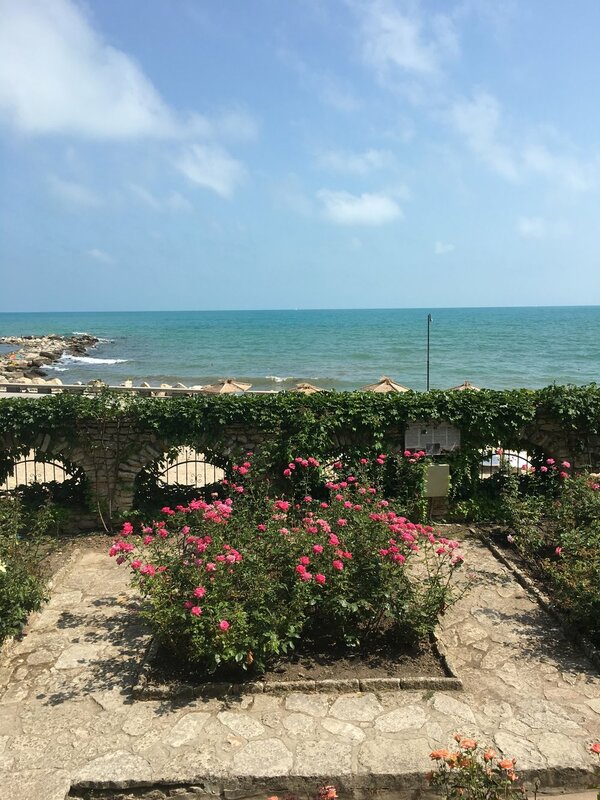 Due to the location of Varna, we had the chance to do small day trips to Balchik and Nessebar. Nessebar is extremely touristic due to its ancient ruins and because it's a UNESCO location. Sadly, it has lots of tourist trap shops. Also, even though it's a peninsula there are no beaches. Balchik is a little town that has a gorgeous botanical garden, the Balchik Palace. Overlooking the sea, the castle and its gardens are beautiful, a must-see stop. Our journey in Bulgaria reached an end after 10 days, we had to go back to Sofia to leave the car and to take a flight to Greece, our next destination. On our way back, we planned to stop at Veliko Tarnovo but the day was extremely hot and we were a bit tired by the road, so we decided to stop just for lunch and a quick stop at the fortress. • Plan 1 day in Sofia to take a car to go to the Vitosha mountains. They are only 30min away from the city centre. 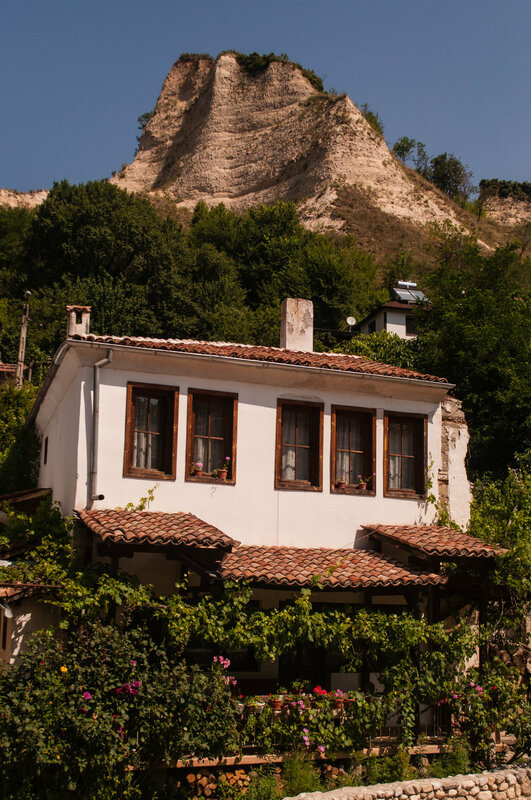 • Instead of staying in a traditional house in Ruse, I would have done it in the Melnik region since it is more picturesque and you save tons of driivng hours. • I would not have stopped in Ruse, I wish I had taken that time to go to Belogradchik instead. • We were told that the north or the south of the black sea had more beautiful beaches than the ones in Varna. I would have spent fewer days in this region. • I wish I could have spent more hours in Veliko Tarnovo. • In general, I felt that 10 days in Bulgaria was a bit too long. 7 days with these recommendations would have been the perfect road trip. Here is some basic info that will hopefully make your travel a little easier. Bulgaria is part of the EU but it does not have the Euro, the currency is the Bulgarian Lev. Also, the currency could be hard to find abroad so I would suggest to bring euros and changing them in Bulgaria. Prior to the trip, we read that the roads were in very bad conditions but since we come from Quebec we found that they were very good when compared to ours. Keep in mind that the country does not have enough highways which make the trips longer. It might be a good idea to glance over the European driving code, there were a lot of signs that we did not know what they meant. The country is extremely safe! A lot of people asked me about safety but we did not feel that this was an issue. Bulgaria has 4 seasons, so it all depends on which season you prefer to travel and the things that you like to do. Summer is great because you can go to the beach but if you are a ski lover then Bulgaria also has great mountains. The easiest way to get to Bulgaria will be by plane, the major international airport is in Sofia but other cities like Plovdiv and Varna also have international airports. You can also arrive to Bulgaria by land through other bordering countries if you are doing a European road trip. However, you need to keep in mind that not all car rental companies will allow you take rental car beyond their borders. You can drink tap water so ditch your plastic bottle and fill your reusable bottle at the hotel. Like the rest of Europe, Bulgaria has a standard voltage is 230 V and the frequency is 50 Hz. What to eat in Bulgaria if you are lactose intolerant? Bulgarians love their dairy! Don’t be surprised if you see locals having a pint of milk during lunch. Most of the traditional dishes contain cheese or have some sort of dairy so the choice is very narrow and at times a little challenging. However, I was more than happy to eat traditional salads and the ubiquitous chicken kebab and meatballs.